Bee spotters surpass 1,000 verified bee spottings in a single season! For the second year in a row, we have reached a record number of verified bee spottings submitted. In 2017, our bee spotters contributed over 800 spottings, the most we had ever received in a single season up to that point. This year, we were thrilled when we surpassed last year's number by late August, and we hoped to crest 900 this year. Well, as it turns out, our goals were too modest, since we have just identified our 1,000th spotting! At the time of this writing, BeeSpotter has 1,016 verified bee spottings for 2018. We would like to extend a huge "thank you!" to all our dedicated bee spotters contributing spottings to BeeSpotter -- we couldn't do this without you! 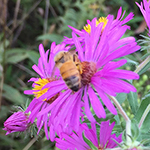 Our 1,000th spotting of this year was a honey bee submitted by the St. Louis Bee Brigade. Our thanks go out to the Bee Brigade for all their excellent work spotting bees and submitting those spottings these past two years!